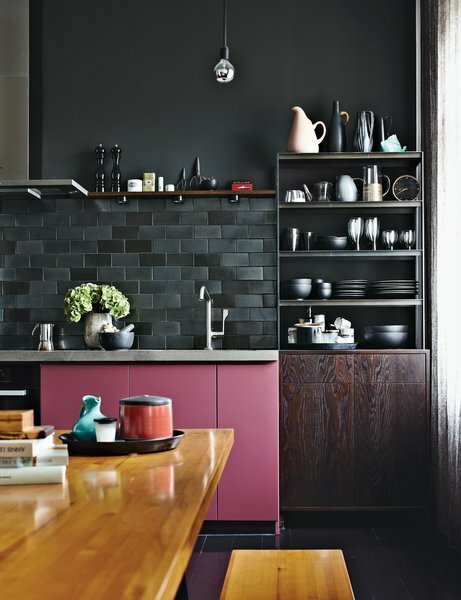 With a confident color palette and clever space-saving tricks, designer Peter Fehrentz transforms a 646-square-foot apartment in Berlin. Until recently, Peter Fehrentz lived full-time in Hamburg, Germany. But he longed for a pied-à-terre in Berlin, a city he describes as “lively, complex, multicultural, and, for me, a source of inspiration.” His brother and many friends lived there, and he frequently visited. Finally, in 2009, he took the plunge and purchased a flat in Schöneberg, an up-and-coming neighborhood in west Berlin known for its art galleries, cafes, and fashion boutiques. In this area, apartments seldom come on the market—so when this one did, he pounced, despite the fact that it held little aesthetic appeal. The fourth-floor unit had no direct sunlight and no balcony; it consisted of a warren of tiny rooms; and it measured just 646 square feet. The bathroom was less than three feet wide, and the only way to get into the shower was to climb over the toilet. Located in the side wing of a turn-of-the-20th-century building, the unit lacked plaster ornamentation and architectural detailing—indicating its past as servants’ quarters. “Normally, you wouldn’t invest much money and time into such a humble place,” says Fehrentz. But he saw the potential for a stylish, refined, and sophisticated place to show his work to clients.